Finally a reprint of the booklet Thames Goldfield Schools is available. The cover has been altered to include a photograph that was found after the publication of the first edition last year. Not long after the goldfield opened in August 1867, families started descending to The Thames. The families on the whole were poor, but schooling while not yet compulsory, was a priority for most families. Private schools proliferated alongside those receiving special state funding. 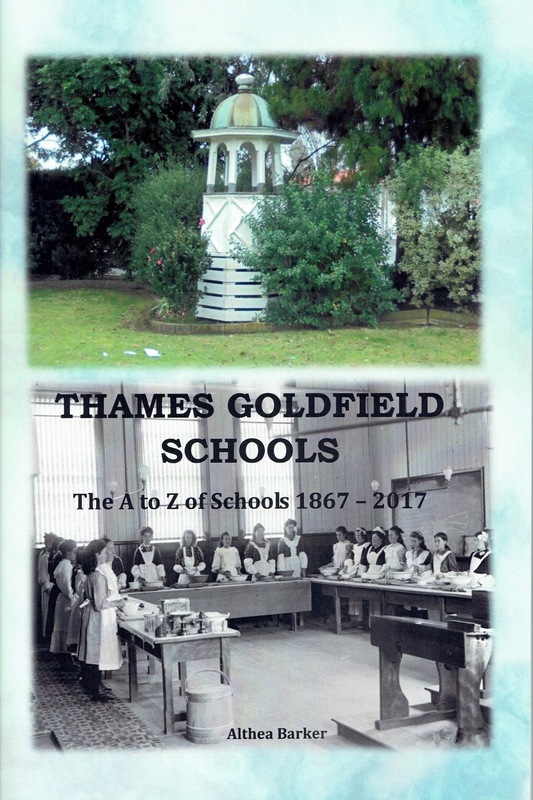 A list of known schools has been collected, and a summary of each school is given in the Thames Goldfield Schools booklet. Cookery Class with Miss Millington 1907. Hammond, Thomas William George Howard, 1868-1967,ca. 1907,PH-1991-12-A1041. The opening of the new technical school building took place 4th August 1905, the land had been donated by past Thamesite Mr Arthur M Myers, a framed photograph was revealed in his honour. 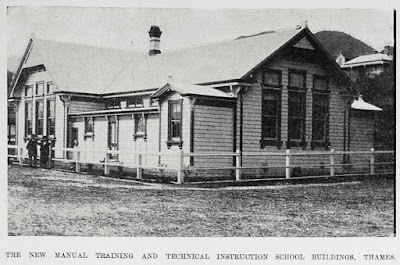 An accompanying inscription read: “A very kind benefactor to whom those who attend this school are deeply indebted.” Prior to this, Technical and Continuation Classes had been held in the Kauaeranga School during 1902-1904 (at least).130 A glimpse of the cooking classroom 1907, can be seen on the front cover of the Thames Goldfield Schools booklet. The school was located right on the corner of Sealey and Rolleston Street, where the Thames High School Gymnasium is located today. 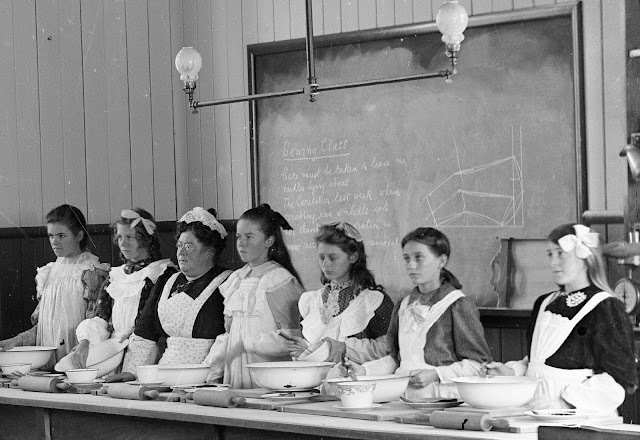 A closer look: Miss Millington (3rd from left) and the girls in the cookery class c1907. Rolling pins, crockery bowls and utensils ready for the days recipes lesson. 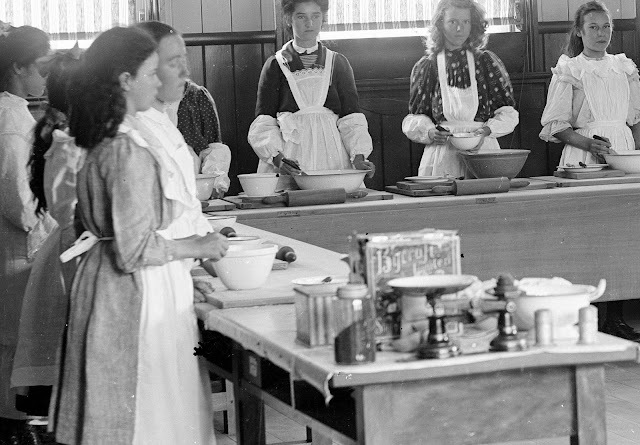 Miss Millington left the Thames Technical School in June 1907, at which time the students presented her several gifts including photographs of the school and cookery class. It is assumed that this photo is one of the gifts that Miss Millington received a copy of. The Thames Star 13 June 1907 reported that another gift was a set of silver serviette rings. Some of the pupils mentioned were Misses Lizzie Bulling and Violet George; and the headmaster was Mr Marsdon. 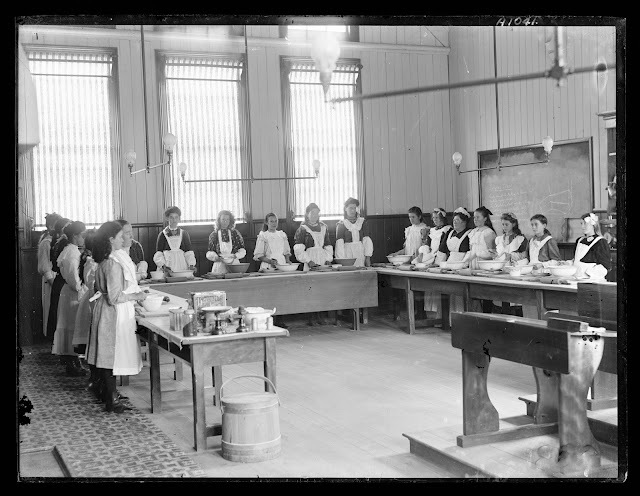 The photograph above will bring back memories of manual cooking classes for many. The days of no cooking unless you had an apron! The style of apron varies, and a couple of pupils even have bands/covers on their lower arms. The room must have been used for sewing classes as well, as a stern warning is written on the blackboard. "Sewing Class - Care must be taken to leave no needle lying about. The Caretaker last week, when scrubbing, ran a needle into their thumb..."
The Thames Technical School, the new building was opened in 1905.